when i first started wearing makeup, my two essentials were mascara and concealer. the mascara was for my vanity. the concealer was a necessity. i had such bad acne growing up that i was embarrassed by it. i also scar really easily so even if my skin was o.k.-ish the spots were still there. i would buy whatever i could with whatever little money i had so it wasn't like i was getting something good. more often that not, it would further irritate my skin. but there i was every morning gooping on that concealer. drugstore makeup has come such a long way from my growing up that i find myself gravitating towards it more and more. i rounded up some of my favs ranging from a light coverage to a more full one. Garnier Skin Renew Anti-Dark Circle Eye Roller- this is a two in one product. it is a caffeine based gel that helps correct the appearance of dark circles while the sheer concealer blends easily while covering and brightening the area. it has a roller ball applicator that is so cool to the touch. it feels so good rolling it over my tired eyes in the morning that i often apply a bit too much as my eyes roll towards the back of my head and i groan in delight. but the thing is, you really can't over apply this product. the formula is thin and sheer and i use this brush to blend it out. Maybelline Instant Age Rewind Eraser- i was late to the game on this concealer. the formula is thin but provides excellent coverage. it also brightens the area and makes me look more awake. i tend to go for this product on 'how is it not Friday yet?' days. L'Oreal True Match Super Blendable Concealer- as the name states, this formula is super blendable. you really cant beat the color match of this product. you can use it under your eyes, on spots, or to cover redness. it's an all in one product and quite possibly my favorite one. it does not crease or flake and has a lasting quality. this is a medium to full coverage concealer. L'Oreal True Match Crayon Concealer- this guy! oh man he and i are besties. the formula is very similar to Benefit Boi-ing Concealer, which was my savior for my bad skin as an adult. it is thicker so think medium to full coverage. it blends out beautifully. i normally use my fingers for this. it stays put and doesn't crease. i have used this under my eyes and i did not have an issue with it either. 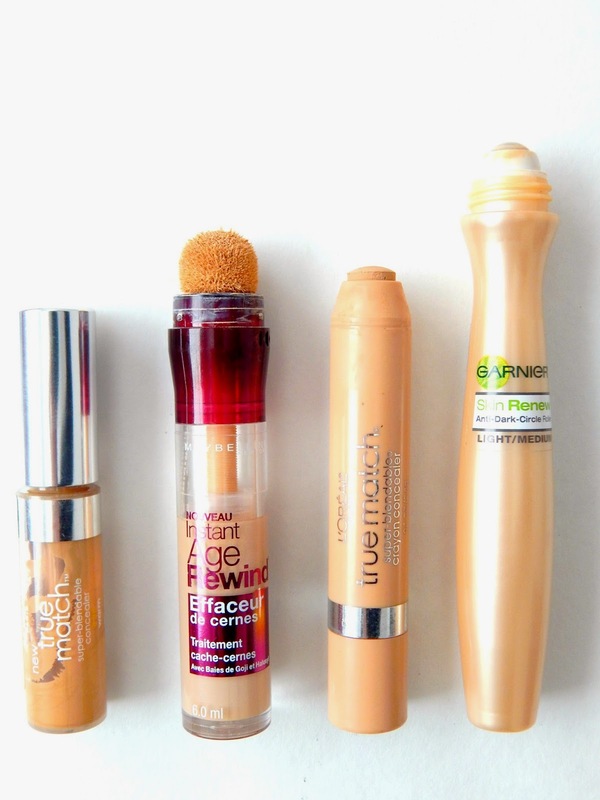 which drugstore concealers are your must haves?